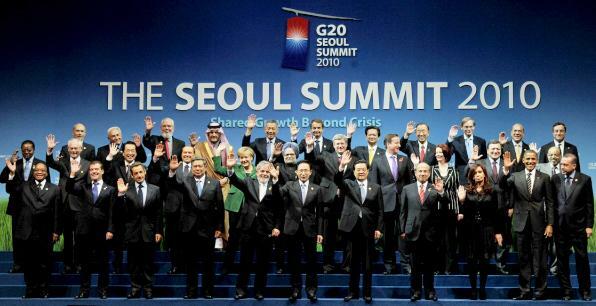 SEOUL, South Korea, November 12, 2010 (ENS) – At the Seoul G-20 Summit today, leaders of the world’s 19 most industrialized nations and the EU said they have made “substantial progress” toward phasing out fossil fuel subsidies in the 14 months since their decision to do so at last year’s G-20 Summit in Pittsburgh, Pennsylvania. The G-20 leaders re-affirmed their commitment to phase out fossil fuel subsidies in the medium term, by about 2020. The United States will do its part. President Barack Obama said he is committed to working with Congress to phase out over $3 billion a year in preferential tax incentives for the coal, oil, and gas industries, consistent with his administration’s FY2010 and FY2011 budget proposals. Phasing out fossil fuel subsidies encourages energy conservation, improves energy security, helps meet budget goals and provides a critical down payment on our commitment to reduce greenhouse gas emissions, according to a statement today from the White House..
A gradual multilateral removal of existing fossil fuel subsidies by 2020 could result in global greenhouse gas emissions dropping by 10 percent by 2050 relative to what is otherwise expected, the White House stated. “We reaffirm our resolute commitment to fight climate change, as reflected in the Leaders’ Seoul Summit Document,” they declared. The 20 leaders expressed their appreciation for Mexican President Felipe Calderon’s briefing on the status of the UN Framework Convention on Climate Change negotiations that open November 29 in Cancun. They also thanked Ethiopian Prime Minister Meles Zenawi for his briefing on the report of the High-Level Advisory Group on Climate Change Financing submitted to the UN Secretary-General. The Advisory Group’s report, issued earlier this month, found that it was “feasible but challenging” for industrialized nations to meet their commitment last year in Copenhagen to raise $100 billion annual to help poorer countries cope with climate change. “We will spare no effort to reach a balanced and successful outcome in Cancun,” the G-20 leaders declared. At Pittsburgh last year, the G-20 leaders committed to rationalize and phase out inefficient fossil fuel subsidies over the medium term. Since then, the G-20 countries have put forward national strategies and timeframes to meet this commitment and are now working on identifying the resources needed to implement national strategies. 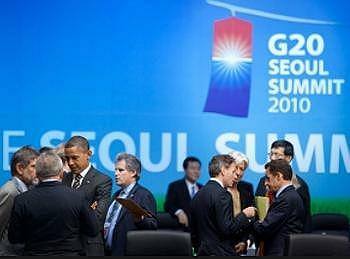 A number of countries have already made policy decisions in accordance with the G-20 commitment. In Mexico, the government has begun phasing out motor fuel subsidies while conducting a household-level census of fuel consumption that will allow the government to implement a well-targeted support program to compensate low-income households. In June 2010, India decontrolled gasoline prices and raised the prices for diesel, kerosene, and liquid petroleum gases (LPG). India also announced plans to phase out the remaining diesel subsidy in the medium term. This year, both Russia and China initiated programs raising the price of natural gas paid by their domestic consumers. The International Energy Agency, World Bank, and Organization for Economic Cooperation and Development today submitted to G-20 leaders in Seoul a joint report updating their earlier analysis to reflect the new phase-out policies implemented this year. The report found that substantial progress had been made, but that the value of fossil fuel consumption subsidies remained over $300 billion in 2009, a heavy burden on government finances that displaces important public investments, worsens balance of payments, leads to underinvestment in infrastructure, and contributes to energy shortages. “The Copenhagen Accord and the agreement among G-20 countries to phase out subsidies are important steps forward. But, these moves still fall a very long way short of what is required to set us on the path to a truly sustainable energy system,” said Nobuo Tanaka, executive director of the International Energy Agency Tuesday in London at the launch of the latest edition of the IEA’s annual World Energy Outlook. “Renewable energy can play a central role in reducing carbon-dioxide emissions and diversifying energy supplies, but only if strong and sustained support is made available,” Tanaka said. The G-20 leaders asked the international organizations to update their report and assess progress being made in advance of the G-20 Summit next year as a means of holding themselves accountable to their commitment to phase out fossil fuel subsidies. The leaders also agreed to take concrete steps to make the world’s physical oil markets more transparent and to continue to improve the regulation of financial oil derivative markets. These actions are expected to reduce the volatility of oil prices, benefiting both energy producers and consumers. The G-20 is comprised of: Argentina, Australia, Brazil, Canada, China, France, Germany, India, Indonesia, Italy, Japan, Mexico, Russia, Saudi Arabia, South Africa, Republic of Korea, Turkey, United Kingdom, United States and the European Union.